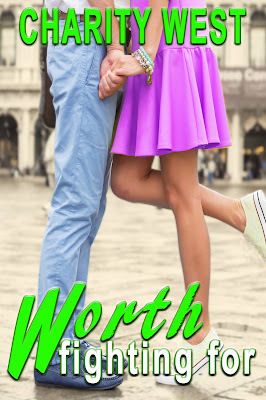 High School senior Lily Rhodes has been in love with her brother’s best friend nearly all her life. When nineteen-year-old Jake joins the Marines and is shipped overseas, she worries she’ll never see him again, and wishes she’d been braver before he left. Lily vows that if Jake comes home, she’ll tell him how she feels. But when Jake is injured by an IED and is discharged from the Marines, he comes home changed, bitter and broken. Despite the fact he's loved Lily for the past three years, he no longer feels worthy of someone like her. Not one to back down from a challenge, Lily knows the best things in life are worth fighting for. Lily carried the food to the kitchen and got down a plate for her father. She knew if she just gave him the containers, the food would sit uneaten on his desk. Giving him a plate and fork seemed to make a difference though. Shrimp fried rice, orange chicken, and lo-mein covered the dish. She snagged a bottle of water out of the fridge and carried it down the hall to her father’s office. The door remained open from her previous intrusion, but he was clicking away again, hard at work. She set the plate down on his desk along with the water. Her dad didn’t break stride with his writing, looking almost feverish with his obsession. The thunder boomed overhead, and the lights flickered for a moment. It was enough to make her father pause, at least long enough to hit the save button, and then he glanced her way. She knew that wasn’t what he wanted to do. The quick darting of his eyes from her to his screen and back again was all the assurance she needed that he wanted to keep working on his book. Considering the drought he’d recently been through, where he barely wrote a few hundred words a day, she knew he needed to spend his time writing while the story was speaking to him. “I will,” she promised before easing out of the office and closing the door. Lily went to her room to retrieve her purse and keys, before slipping out through the garage door and walking over to her white, gently used Honda Civic. The car had been a present from Jake and her brother for her sixteenth birthday. It had been a one-owner car, with hardly any miles on it, despite the fact it was now nearly ten years old. Several of her friends at school had received brand new cars for their birthdays that year, but Lily had thought hers was far more special, just because Jake had helped pay for it. He’d been a junior, and she had wondered where he had gotten the money, and she’d probably never find out. She knew Riley had used part of his inheritance from their grandparents. As she backed out of the garage, the sky seemed to open up, and the heavens rained down as the storm intensified. Her wipers worked overtime as she drove the narrow, twisting road into town. The parking lot at the grocery store was nearly empty, and she wasn’t really surprised. Aside from her, who in their right mind would go shopping in this weather? She pulled into a parking space and reached into her floorboard for an umbrella, only to realize she had taken it inside the other day and never put it back. With a groan, she rested her forehead on the steering wheel and blew out a breath. She wasn’t looking forward to getting soaked. The sky lit up with a triple streak of lightning as thunder made the ground tremble under her car. Lily pulled her hood over her head before opening the door and dashing through the rain to the front of the store. When she stepped inside, the cool air made her shiver as she pushed back her hood. Her clothes were drenched and sticking to her body as she got a shopping cart and started down the first aisle. She didn’t want to get too much since she’d have to load the car in the rain, but she wanted to make sure there was enough food, snacks, and drinks to last at least a day or two, in case the storm didn’t break. She tried to stay away from sweets, except for the occasional pint of ice cream, but she threw in some Oreos and a half-gallon of milk, along with some seasoned turkey breasts, a sack of potatoes, and a can of carrots for dinner tomorrow. Thinking ahead, she also grabbed a frozen pizza for lunch the next day, and then stopped in the coffee aisle to feed her father’s addiction. A twelve-pack of grape soda rounded out her shopping spree, and she headed for the checkout. The clerk looked bored as she scanned Lily’s items and sacked them. Lily loaded the shopping cart and paid for her purchases, then pushed the cart to the door. The rain looked like it had slackened a little and she made a mad dash for the car, the shopping cart bumping and jolting over the uneven pavement. She popped her trunk and quickly loaded everything, before pushing the cart off to the side. Usually, she would put it in the cart return, but that was seven spaces away, and she was already wet enough. Lily cranked the engine and blasted the heat, trying to chase away the chill she still felt from the cool air in the store and then getting wetter on the way to the car. Turning on her lights, she pulled out of the space and headed for home. She’d barely turned onto the road before the sky turned an ominous black and green mixture that scared the crap out of her. A moment later, the rain got so heavy that she could barely see through the windshield. The road was too narrow for her to pull over and wait for the weather to clear, but she did slow her pace and turn on her flashers. As Lily went around a particularly sharp curve, headlights cut through the darkness and nearly blinded her, causing her to jerk the wheel. The tires slipped and slid as they tried to gain traction. Lily’s heart raced in her chest, beating so loudly she could hear it pulsing in her ears. Her hands scrambled on the wheel, trying to get control of the vehicle; the on-coming car smashed into the driver’s side of her car, knocking her off the road and down the incline. Her car tumbled and rolled, slamming Lily’s head into the window and steering wheel several times. Finally, it came to rest at the bottom of the gorge. Blood dripped into Lily’s eyes, and she tried blinking it away. Everything blurred and swayed until it all went black. Good luck with the Giveaway! Hope you didn't miss that one above! !